Summer Camp. I heart you. 1991. That’s when it all started. Dad was a counselor and I was the coolest of the cool- a rising 6th grade pre-camper. We had our own cabin. On the boys’ side of camp. It was an awesome year….for me. For Dad? Not so much. One experience with 8th grade boys and an overflowing toilet, and Dad decided camp wasn’t for him. But it was for me. I fell in love that week. And I’ve never been able to shake it. FFA gets in your blood. Check that- it’s not FFA, it’s more than that. It’s that sound of the door of Mobley swinging open and the rush of air conditioning. It’s the smell of maple syrup in the dining hall letting you know that pancakes are the breakfast of choice. It’s the grass on the field rubbing your ankles as you follow the obstacle course. It’s the view from the top bleacher in Mobley, in the middle of worship, about 7 1/2 seconds after God’s presence falls like a cloud. It’s the campers. It’s the counselors. It’s the surprises. It’s the traditions. It’s the new t-shirts and then the array of old ones, scattered on camper bodies throughout camp. It’s when the bus pulls up and when the bus pulls away. It’s the seats in Georgia Power that are worn deep by many years of prayer meetings and impact groups. It’s the gross games and the challenges. It’s the team leaders and the bandannas. It’s the videos and the skits. All of it. And it’s my memories. The things God has done in my life in that place. Truly EVERY significant spiritual experience I had in middle and high school happened in that campground- in the cabins, in Mobley, in the small chapel that we aren’t allowed to go in anymore. It’s who God is and how He moves in that place that make it sacred to me. To us. To thousands of people who have attended Summer Camp (or FUMC Youth Camp) and been changed for LIFE by what God does there. And I almost didn’t go. Then, through many prayers by others and urging in my heart, I changed my mind. Within 10 minutes of being there on Sunday, I remembered why. Because I really love youth ministry. I am a better, stronger, and more confident Annie when I am pouring my life and heart into students. It’s just true. I’ve been praying a lot about who God made me and what my purpose is. And to be honest, I don’t have an answer. But I do know this-I am more satisfied with my life and I feel more complete, in line, centered, whatever you want to say- when these guys, and their friends, are an active part of my life. And camp reminds me of all of that. Living with them, though admittedly exhausting, is the best week of my year. A friend of mine put it perfectly today- “It is physically draining but emotionally strengthening”. Absolutely. 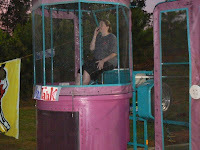 In fact, I can’t stop calling and emailing the girls from my cabin because I miss them! I miss jumping on them first thing in the morning and singing in their ears until they remind me that “I only need 10 minutes to get ready!!”. (Shout out to my girl Chels!) I love hugging them as they cry over broken hearts, lives, moments, or relationships. 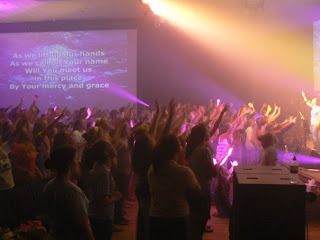 I love kneeling with them at the altar and encountering God alongside them. It was an amazing week. So many laughs, so many solid conversations, so many jokes that make me smile just thinking about them. A great new t-shirt. And so many memories that I will add to the collection from the last 16 camps (minus 1- Summer Camp 2000.) God used last week to do a lot in the lives of students and in my life- the word that will always be attached to this camp for me is “redemption”. 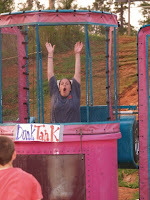 Let me not forget to mention that I got to be in a DUNK TANK for 1 1/2 hours! IT RULED. It’s on the list of things I want to do before I die. So needless to say, it was my own personal “90 minutes in Heaven”. And because I’m a glutton for punishment, I include these for your viewing pleasure. My camp experience was better because ______ was there. I laughed with ________ and yet at the same time, I knew that ________ was making a big difference in the lives of the people around them. 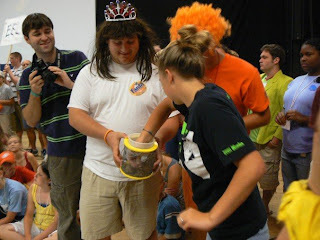 I’m really glad I know ________ and I hope ________ is at camp for many years to come.